With the rise of antibiotic resistant bacteria and other environmental developments, many facilities now require that hard surfaces, like flooring and coatings, support their germ and mold-fighting efforts. At Florock, our antimicrobial epoxy flooring and other resinous coatings are powerful enough to meet today’s challenges, formulated to provide protection that stays strong and doesn’t fade. As part of a total program, our antimicrobial epoxy flooring provides contamination-fighting properties not only across the surface of your floor, but all throughout the polymer material used to make it, giving you the additional anti-pathogen safeguards you need inside and out. Our EPA-registered FloroSeptic antimicrobial additive is optional for any of our commercial and industrial concrete coatings & systems. Added to the liquid resin components during manufacturing, the antimicrobial protection becomes an integral part of the cured floor coating system, whether it’s a high performance industrial concrete coating or one of our innovative, custom decorative floors. Unlike antimicrobial systems that only coat the top of your traffic surface, our antimicrobial flooring has protection throughout. The types of facilities requiring the superior protection of Florock antimicrobial epoxy flooring and other resinous coatings are numerous and varied, but they all have one thing in common: A mandate to keep mold and germs at bay. 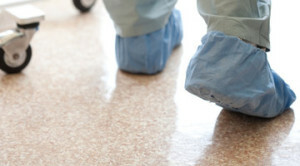 Antimicrobial and antibacterial floor coatings can be an important contributor to optimal sanitation and pathogen control in facilities required to meet strict standards. The ability to add FloroSeptic Antimicrobial to liquid resin components at the factory allows Florock to offer optional antibacterial safeguards in our entire floor coating line. The active ingredient in our antimicrobial flooring is non-metallic and safe for inhabited environments, and does not contribute strong odors during installation. By adding its critical anti-pathogen protection to environments like restrooms, locker rooms, and communal work and living spaces, you enhance the remarkable, lasting value you get with your skid-resistant, seamless, easy-to-clean concrete coating. Your local Florock expert can help you select the right topcoat for your antimicrobial flooring system based on your maintenance routine and facility activities. This helps ensure that you have a floor that meets all of your daily needs, including a surface that can withstand harsh disinfectants, industrial steaming and the other rigors of daily cleaning. Exceptional quality, service and support—it’s all part of the optimal Florock antimicrobial flooring solution.